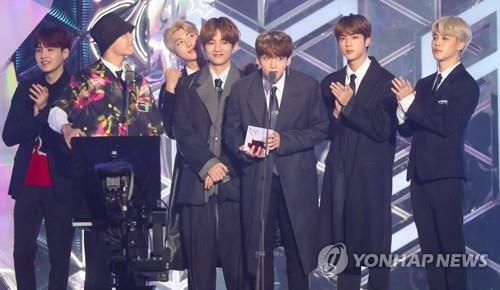 SEOUL, Nov. 21 (Yonhap) — Globally popular South Korean boy band BTS has stayed on the Billboard 200 main albums chart for the 12th consecutive week. According to the chart updated on Tuesday (local time), the repackaged BTS album, “Love Yourself: Answer,” ranked 69th in the week ending Nov. 15. The album also ranked second on the World Albums chart, 12th on the Independent Albums, 68th on the Top Album Sales and 71st on the Billboard Canadian Albums. BTS will perform at the Osaka Kyocera Dome at 6 p.m. on Wednesday, Friday and Saturday. The group will then continue the Japanese section of the tour in Nagoya on Jan. 12 and 13, and Fukuoka on Feb. 16 and 17.